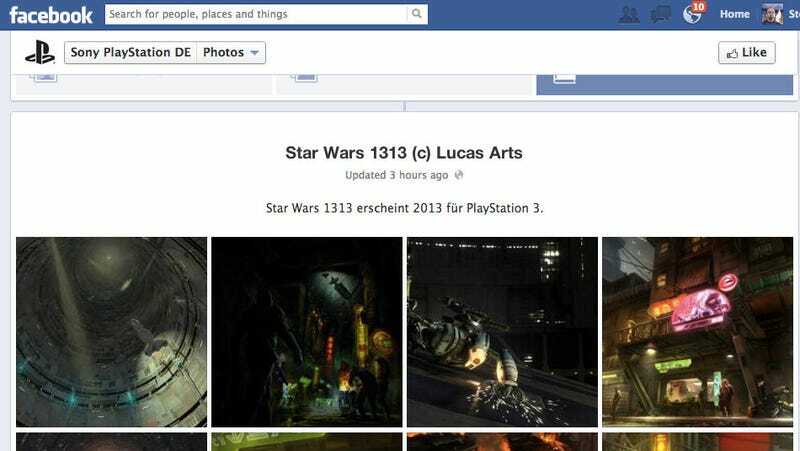 For some reason, the official Facebook page for PlayStation in Germany listed Star Wars 1313 as an upcoming game for PS3 today. We're asking them and LucasArts why, because this is a bit of a surprise and may very well be what we in America call a typo. Star Wars 1313 and its out-of-this-world graphics debuted last June at E3, where LucasArts officials coyly only said that the game was running on high-end PCs using a heavily-modified version of the Unreal Engine 3, a graphics engine that is set to be displaced by the next-gen Unreal Engine 4. It's been assumed (by us and others) that 1313 would be for next-gen consoles, which are expected to be announced by this June. A next-gen release wouldn't disqualify the game from also coming out for current systems with inferior graphics, of course. We'll let you know what we hear. We asked Lucas PR: "The official PlayStation Germany site is listing Star Wars 1313 for PS3. Is the game coming to that platform? Or is the page in error?" They've said: "No, that was an inaccurate post. We have not confirmed any platforms yet for 1313 and do not have any announcements to make at this time." The official PlayStation Germany Facebook page responds. German fans are surprised at today's listing, too. To quote one of them, "MIr würde es zwar auch gefallen wenn die PS4 jetzt bald raus kommt. Und dafür dann direkt Uncharted 4, The Witcher 3 oder Star Wars 1313. Aber egal....... Hauptsache Futter für die PS3.^^"
Or, as Google Translate puts it, "To me it would even like when the PS4 comes out soon now. And then directly to Uncharted 4, The Witcher 3 or Star Wars 1313. But anyway ....... Main food for the PS3. ^^"
Thanks to PlayNews.biz for the tip.